Schoolboys have always played games. 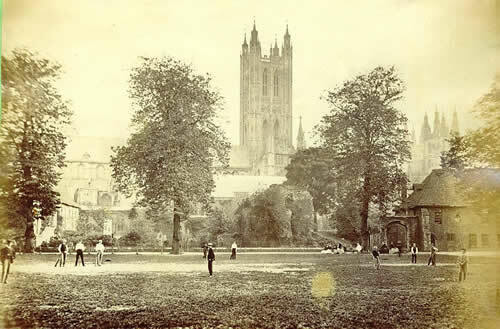 The Dean and Chapter records make it clear that the Green Court was usually regarded as a playground for King’s Scholars, and from time to time regulations were issued relating to the boys playing there (or not) and issuing various restrictions. There are stray references to races as early as the 1620s and there are mentions of cricket and swimming in the 1770s. All such games were informal and unorganised. The masters (and the Cathedral authorities) did not take any interest unless there were disturbances. Breaking windows was a regular problem. Games were pastimes, and might well be marbles, hoops, tops, or just fighting. Sir Guilford Molesworth (KS 1836-40) makes particular mention of the fights in his memoirs, but doesn’t mention any other games. Country sports of various kinds were popular, from field sports to roaming the countryside (‘rambling’ in today’s parlance). Cruelty to animals was the norm. In the mid-nineteenth century sport began to change. See: The Games Book 1852. Cricket was by far the most organised and there are matches reported in the Kentish Gazette from 1845 onwards. The School used the Beverley Club’s ground at St Stephen’s, at the Barracks (on the Sturry Road) and then at the St Lawrence Ground from 1847. Several OKS from the 1830s, 1840s and 1850s went on to play matches for Kent: see First Class Cricketers. Football (an early version of rugby) was played on the Green Court and was more informal with the School’s own rules. The Club joined the Rugby Football Union in 1872. There was some hockey in the 1850s, and again in the 1890s, and the sport was revived in 1930. Rowing started at Fordwich in 1862, but had a chequered career before a Boat Club was firmly established in the 1890s. Athletic sports, also on the Green Court, are recorded from the 1860s. Paper chases were also popular.